Ok, this is a tough one. This was the first system I ever programmed and know very little about it. My school district had one and when I was in junior high, I would call it up and connect to it using an ASR-33 Teletype with a 110 baud acoustic coupler modem. It ran a version of Time-Shared BASIC. I never actually saw the system itself, our teacher always wondered why we would even be interested in seeing the system, claiming it just looked like a desk. I still have the paper tapes I saved my programs on and a reference card listing the commands but otherwise I haven't been able to find anything else for this system. What little I have been able to learn so far is from a Web page on the history of the HP 3000. It seems the HP 2000 Time-Shared BASIC System was released in 1968 and was HP's first big success in computers. 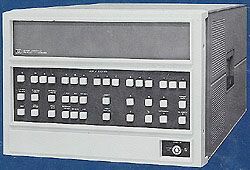 It was based on the 2116 computer, basically a DEC PDP-8 streatched from 12 to 16 bits, which HP inherited when it acquired Data Systems Inc in 1964 from Union Carbide. The 2000 supported 16 to 32 time-sharing users running BASIC programs. This product was incredibly successful, especially with schools. The original 2000A system was created by two guys working in a corner: Mike Green who went on to found Tandem much later and Steve Porter who also went on to found his own computer company. Heavy sales of the 2000 brought the computer division of HP its first positive cash flow. This is one system that I really want so if you have one or if you know anything else about them, please email me. I have received a copy of the 2100A Computer Reference Manual from Paul Coad. Thanks Paul! If you need some info from this manual, let me know and I'll try and help you out.